At the All-Star Level, players will begin to gain strength, quickness and the ability to better react to game situations. 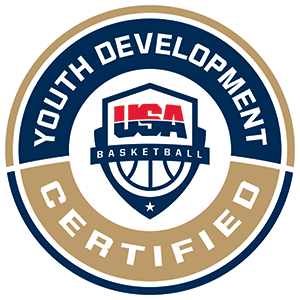 Practices will shift towards team concepts and competition, while still heavily emphasizing skill development. Positive Coaching Alliance focuses heavily on goal-setting and the pursuit of goal-achievement. Developing those processes in youth players is one of the greatest gifts a coach can give. Steady progress toward goals keeps players enthused, engaged and willing to work hard. That way, they develop as individuals and the team as a whole has a better chance to succeed. More importantly, the players can take that goal orientation to other aspects of their lives, such as school work. And even more important than that, the longer players work toward goals, the more ingrained that practice becomes so that when it comes time to pursue critical goals in their adult lives – perhaps with children depending on them – they can call upon what they learned from their youth basketball coaches. Warming up is an extremely important part of basketball. Players should make sure their bodies are prepared to play by getting their muscles loose and their body temperature up. Warming up can keep players healthy, lengthen playing careers, and help players do their best. The player will dribble through the cones in a zig-zag motion switching hands as they change directions all the way past the last cone and then stop. Once the player is half way through the cones, the next player can begin. After all the players in the group have dribbled through the cones, the first player will repeat the process by going back through the cones in the opposite direction. All players will have a ball and stand on the baseline. 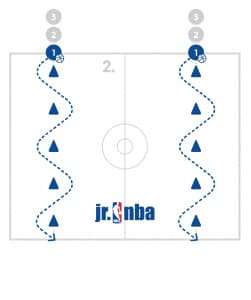 The coach will tell the players when to begin and the players will walk towards the opposite baseline and dribble as many times as they can consecutively between their legs. If the player loses control of the ball, dribbles two times on one side of their body, or has any break in dribbles from between the legs, the dribble doesn’t count and the player will start over. Have the players remember their furthest distance or highest number of consecutive dribbles and try to beat that. If a player walks the full length of the court, have them continue dribbling between the legs as the make a turn and come back. All players need a ball (or share) and should find space on a line. The players will jump and split their legs so that their right foot is forward and left foot is back and then immediately jump and split again so their left foot is forward and the right foot is back and continue this process with their lower body. Every time the player jumps and splits their legs, they will dribble between their legs quickly. The players should players will quickly and repeatedly throw the ball between their legs. The players should keep their feet and legs moving quickly. The players should have 2 balls (or partner up and share). The players will get in a stance and begin by dribbling with their left hand nice and low with 1 ball. After a few dribbles, the players will add dribbling the ball in their right hand up high. 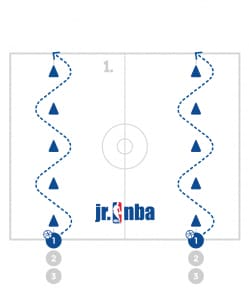 The players will also switch and dribble the right hand low and left hand high. They players should make sure that balls don’t slowly become the same level dribble. The players will partner up and stand across from each other with 1 ball each. One player will be responsible for making a bounce pass and the other player will be responsible for making a chest pass. The players will pass the ball at the same time to each other making either the bounce or chest pass. With every pass, the player will call out loudly the pass they are making. After the allotted time, the players will switch which pass they are completing. It is really important that the players talk and call out their pass to help them continue making the right pass. Have the players start with 2 lines on each wing. One line on each wing will have a ball. The lines with the balls will make skip passes to the line on the opposite wing that does not have the balls. When the player on the wing catches the ball, they will either drive in for a lay-up or dribble in for a shot. After the pass and the lay up, the passer will go the the receivers line and the receiver will go to the passers line. After the allotted time, the players will switch so that their group will now shoot and pass from the opposite sides. Make sure the players clearly define the lines. Put players into 2 or 3 groups based on the number of players. Each group will have a line under the basket and on the perimeter. The group that is close to under the basket will have 2 balls. The first person in line will pass the ball to the first player on the perimeter and will run at them quickly. The shooter will catch, shot fake by sitting low, bring the ball and eyes up on the rim and then explode out of the shot fake for a good move and shoot a 1 dribble pull-up jump shot. The passer will go to the back of the shooting line. The shooter will get their rebound and go to the back of the passing line and the process will repeat. Compete with the other lines before rotating spots. Also mix up which direction the player will go following the shot fake and which foot you would like them to step with first. Make sure the passer runs at the shooter in a realistic way. Teach the players about the angle of a reverse lay-up and why they would use a reverse lay-up. Have the players get in two lines-high above both wings. Have the players in one line start with a ball. The first player will pass the ball to the other line as they move forward. The player in the other line will catch and pass the ball back quickly. Upon catching the ball, the player who started with the ball will take a reverse lay-up. 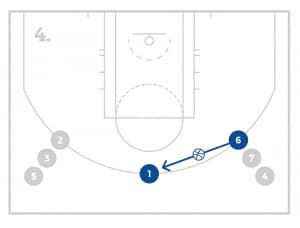 After the lay-up the player from the other line will get the rebound and go to the back of the shooting line and the shooter will go to the back of the opposite line. This process will continue for the allotted time and then switch. Make sure the players make good passes to each other and understand a good and where to hit the backboard. Start with a line on each wing and 1 player at the top of the key with the ball. The player at the top will pass to either wing and cut to the basket looking for the ball. The player on the wing without the ball will “replace” the cutter and fill to the top of the key. The cutter is now out of the drill and will go to the back of the line on the wing that replaced them. The wing with the ball will pass the ball to the top where the player has replaced. 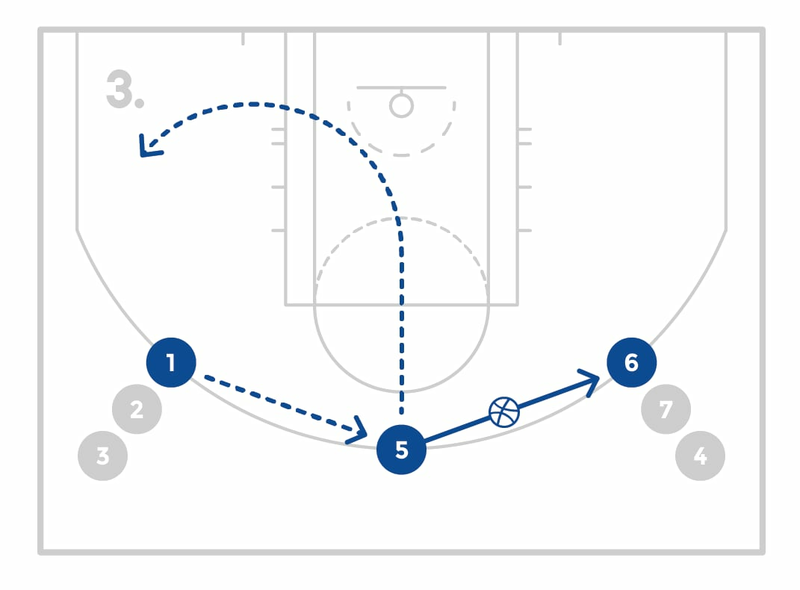 That player will reverse the ball to the other wing and cut to the basket and the series repeats. Cutters only cut from the top. Make sure the players show their hands to catch the ball and stand in the triple threat position before making strong passes. Also emphasize that the cutter cuts hard to the basket looking for the ball with a hand up. Anytime a defensive player is being screened, it is important for them to know where they are on the court, where the ball is, and who they are guarding. Some coaches choose to defend down screens all based on if it’s on the ball side or weak side. Other coaches might require their players know the personnel and defend each player differently. Regardless, the defensive player should always know where they are on the court, where the ball is, and know the ability of the player they are guarding. Have the players partner up with a ball and go to the baseline. Have half the players go to one side of the court and the other to the other side on the same baseline. Have 2 coaches or players at the top as passers and 2 players as screeners starting on a designated point on the wing. Dictate whether you want the screen to be down towards the block or out wider towards the wing. 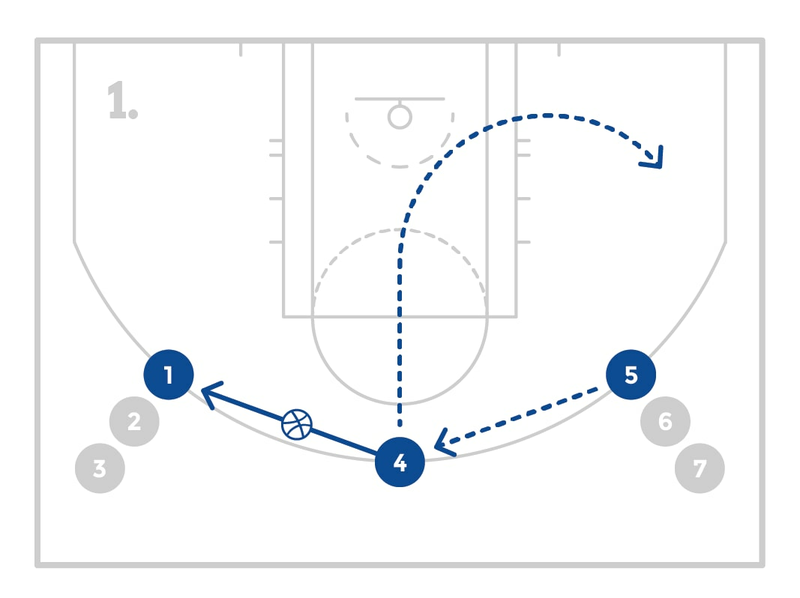 Have the screener work on going to set good screens. Have the offensive player work on setting up the screen, coming shoulder to shoulder and reading the defender. Have the defensive player work on seeing the play, finding the offensive players body and come over the top of the screen taking the space of the offensive player and recovering to the middle of the court. The coach at the top will make the pass and the offensive player will have 3 seconds to take one shot and then the next group goes. Offense and defense will go back to the same line on the baseline and switch roles in their next attempt. After a few screens, the screener (and passer if also a player) will switch with other players on the baseline. After the designated time, switch the lines to the other side of the court. Make sure the players see the ball, get physical and recover to the middle of the court. Have 2 groups start on the court, one on offense and one on defense. Have a coach pass from the top. The coach at the top will make the pass and the offensive team will have 1 possession to score. If the offensive team scores, they stay on the court and a new defensive team comes on. If the offensive team does not score, the defense becomes offense and a new defensive team comes on. Make sure that offense and defense are having both players play both positions. Play until 1 team has 3 made baskets then switch sides. 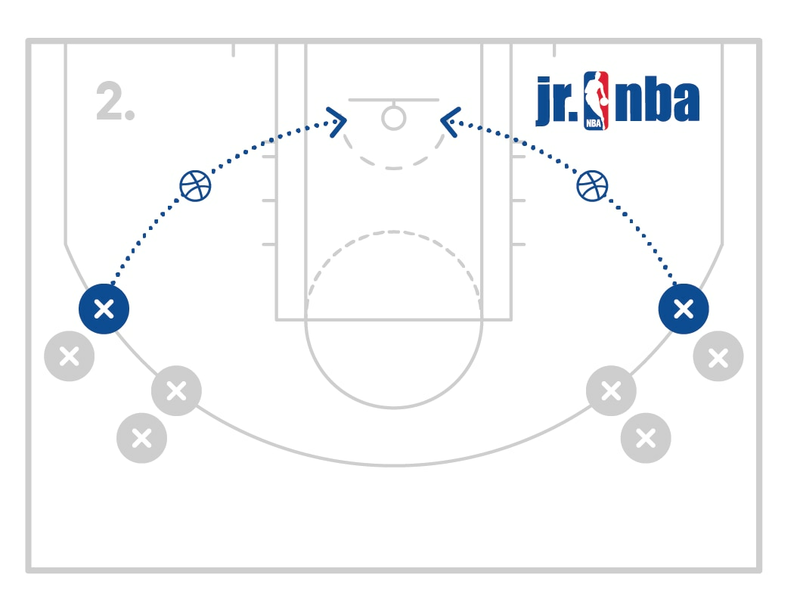 Divide the players into teams of 3 and have 1 team start at half court with the ball. Have to other teams start at each side of the court to start as defense on both ends. If there are extra teams, have them line up on the baseline on one end. 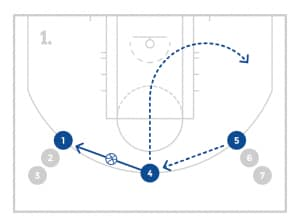 The offensive team will go to score at a basket. 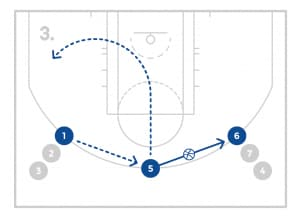 If they score, they will get a point, and get ball back to go the other way towards the other basket. If there is a team waiting on the baseline, they will take the place of the defensive team that got scored on, if there is not team on the baseline, the defensive team will remain there. 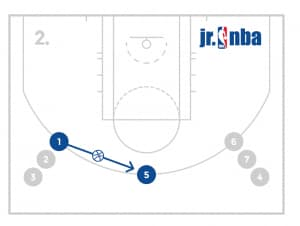 The offensive team will do the same thing at the other end of the court and if they score or don’t score dictates which team gets the ball to go the other direction. Anytime a defensive team gets a stop, they get the ball and go in the other direction. 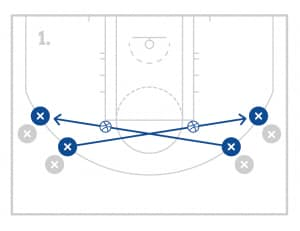 This version of the game will require the players to start every possession with a pass from the top to the wing and a screen away to start the possession. At the conclusion of the All-Star Level, Jr. NBA players should be proficient at each of the following skills. Judging proficiency at this level is the responsibility of the coach.